Nature fun idea No. 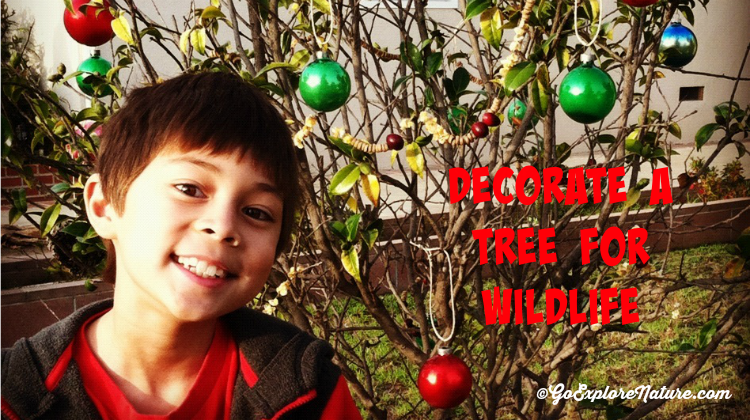 5 on our Countdown to Christmas list was to decorate a tree for wildlife. This was a task a few days in the making. In preparation for our wildlife tree, we made birdseed ornaments and strung fresh garland – both activities that helped us slow down and focus on nature at an otherwise frenetic time of year. We decided to add some sparkly ornaments to make the tree dazzle a bit, too. Once we had our goodies ready, we needed to pick a tree to hang them on. We opted for one in our front yard (the camellia we lovingly nicknamed “Bill”). Its location is prime for bird watching from our front porch. Added bonus: It’s easy for everyone in the neighborhood to see. In fact, a couple of our neighbors have already told me how much they love it. Choose a tree in a spot you know your local birds will frequent. If you haven’t hung bird feeders before, expect it to take a few days for the birds to take notice. Other items you can use to decorate a tree for wildlife include: pinecone bird feeders, fruit, dried apples, raisins – even some pumpkin if you have any. Add other items from nature as desired. Do some bird watching every day!